Michael Novick is a good guy in this fight. Please read his important commentary pasted in below. Please forward to those who may benefit from his perspective and especially to those who are voting in the KPFK Local Station Board elections by the deadline of Oct 15. Mike is a very well respected individual in the activist community. I've known him for over 20 years. He really knows what's going on, especially in regard to the deception employed in the LA Pacifica community about what's happening at Pacifica radio and the degree with which this deception has pulled the wool over many Pacifica listener-sponsors eyes (and ears) not only in LA but especially in other signal areas who would normally recognize such operations. I believe many of the Pacifica listeners and activists outside of LA are basing their understanding of Grace Aaron's agenda (with husband & KPFK Local Station Board candidate Ken Aaron) and those of whom are behind her, on very limited information and a narrow analysis of Pacifica's history. Ian Masters KPFK program, Background Briefing, is the key to understanding what is in store for the entire Pacifica chain of stations (KPFk - Los Angeles, KPFA - Berkeley, WBAI - New York, KPFT - Houston, WPFW - Washington, DC). Their intention is to make Ian Masters a Pacifica syndicated national Pacifica star, sort of following the model when Amy Goodman's Democracy Now was launched during a similar putsch in '95--'97 at Pacifica's stations by the same political forces in LA, Berkeley & Wash DC. However, Ian Masters' program is a very sophisticated and clever propaganda outlet for the US national security state in its effort to reinforce US military and intelligence policy. In other words, deception reigns on Background Briefing and has been key to the continued manipulation and containment of Los Angeles political intelligentsia, especially in the entertainment community (a primary target of intelligence community influence). Within this effort, spearheading Masters' program to Pacifica National is their parallel objective of forcing on all of the stations more uniform content and in order to do that they will remove many of the important programs that have existed on a single Pacifica station, some for decades. Two of those targeted for removal I believe are: Radio Intifada at KPFK and Taking Aim at WBAI in New York. Additionally, this political operation is dedicated to transforming Pacifica into largely a non-profit corporation and foundation-funded outlet, thereby avoiding any shred of accountability to it's listener-sponsors who should be the only source of the network's income. These foundations have a liberal and even "progressive" veneers but are in actuality adjuncts for US propaganda operations, military and economic destabilization operations and phony or limited (hang out) investigative journalism through NPR and PBS, among other sources. The other critical objective of this political operation behind Grace Aaron is the reversal of the democratization of the local boards (listener-elected) and a return of Pacifica's governance structure to an appointed local board model. Thank you very much for your interest and commitment to protecting Pacifica from those who seek to transform the network into another vapid and useless voice for the (phony) Democratic Party. 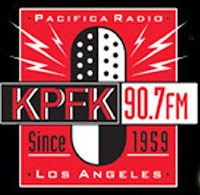 The war of words in the Local Station Board (LSB) elections for KPFK and other Pacifica radio stations is heating up. An open letter from Jim Lafferty, host of The Lawyers Guild (as well as a staffer at the National Lawyers Guild chapter in L.A. and a former interim station manager at KPFK) and a vicious counter-attack from Ian Masters, host of a double-serving of "insider analysis" by intelligence community honchos and academics, Background Briefing and Live from the Left Coast, are the latest salvos in a struggle over the direction of the station and the network that are some of the most valuable assets of the so-called left or progressive movement. As in any election, there is no possibility of bridging the gap -- decisive and exclusionarychoices must be made by everyone, no matter how much we may hate the in-fighting, name-calling, and finger-pointing that passes for debate when the left forms up its circular firing squad. by the LAPD which resulted in a police-prosecutorial frame-up; based on that first-hand experience, he has also worked with me in the Jericho Amnesty Coalition to Free All Political Prisoners, defending Mumia, Leonard Peltier, the San Francisco 8 and other victims of injustice and political incarceration. Lawrence Reyes of the Puerto Rican Alliance, a listener-member of many LSB committees, another ally in the Jericho Amnesty Coalition to Free All Political Prisoners, was singled out for particular vituperation by Ian Masters, probably because Lawrence has been one of the most outspoken and principled internationalist opponents of imperialism, war and colonialism. He, too, is a parent of a LAUSD student, a social worker and union member, a community cultural activist who has brought artists, dancers, exhibits and speakers to Los Angeles to educate the community about the Puerto Rican people and their struggle against US colonialism. Lawrence has fought long and hard for the interests of the listeners, for the needs and voices of the communities of poor, oppressed, working and struggling people in Los Angeles and southern CA to be heard on the air and in the governance of the station and the network. Chuck Anderson is stalwart in the struggle for peace, civil liberties and justice. Like me a grandfather, he retains a connection to younger people just coming in to such struggles. Based in Orange County, he is tireless in his efforts to reach out and organize, to connect with the Palestinian and other Arab and Muslim communities, to oppose the USA PATRIOT Act and other manifestations of a police state, and to struggle for democracy within Pacifica, as well as grassroots community activist access to the airwaves. John Parker may be the best known of the candidates endorsing the principles noted above. He is a leader of the International Action Center, and has been involved for many years in struggles for social and economic justice, against racism and US wars of occupation and aggression, in the effort to free Mumia Abu-Jamal and other political prisoners, and in fighting for the interests of working people. He would bring valuable skills in coalition building to the station board. Ruby Medrano has a long history of activism and grassroots community work, particularly in East Los Angeles, going back to work with the United Farm Workers. She has many years experience with the United Food and Commercial Workers Union. She has also been a leader and activist in the Democratic Party, which honestly is not my cup of tea, but unlike the Aaron slate, she is not trying to turn the station and network into the voice of the Democratic Party, and is willing to work in coalition with others to ensure that KPFK and Pacifica remain committed to free speech and a broad airing of diverse views and debate. Cuco (Refugio Ceballos) is a danzante with the Danza Azteca Cuautemoc, those tireless multi-generational cultural/political/spiritual workers whose commitment to resistance, internationalism, healing and decolonization inspires and amazes marchers and on-lookers alike at protests around the southland. Cuco is a member of the community board and a teacher at Tia Chucha's in the north Valley, and he was also involved in community efforts to roll back the horrible budget cuts at LAUSD and to create a liberation school effort when LAUSD slashed summer school classes earlier this year. His commitment to educating and making space for young people is unquestionable. Tej Grewall is an intellectually-curious young woman of Indian descent who does street level radio journalism as a volunteer, working with the "People Without Borders" collective at KPFK and also serving as a listener-member of the LSB's Outreach Committee helping build the audience and the station's connection to new, younger listeners like herself. She has been on Dedon Kamathi's "Freedom Now" and out on the streets participating in and covering protests for educational justice or against genocide in Africa. Luis Garcia is a former member of the "Local Advisory Board" under KPFK's and Pacifica's former system of governance. He has been a strong advocate for Spanish-language community-based programming on KPFK. I worked with Luis, who is a former probation officer and a "pragmatic prison abolitionist" and member of Families to Amend California's Three Strikes (FACTS) in the Criminal Justice Consortium years ago, and more recently in CURB, Californians United for a Responsible Budget, in the effort to slash spending on the prison-industrial complex and release non-violent offenders from brutal and corrupt prisons into community diversion and reintegration programs. Ian Johnston (c) is a current member of the LSB and participant in LSB and PNB committees who has long roots in the Venice community and has been an activist against CIA criminality and the use by the Bush regime of 9-11 to carry out war and repression. He is a former volunteer board operator and sometime programmer/producer of "Another World View is Possible." He is running for re-election to the Board as a strong advocate for listener access to the airwaves and the board meetings, and against making the station and network a sounding board for partisan, state or "intelligence community" operatives. Three other candidates who have endorsed the same principles as the ones I have mentioned here are Fred Klunder, Dutch Merrick, and Sandi Stiassni, but I have no first-hand knowledge or shared political practice with them aside from hearing them speak on-air or in person. I join in endorsing them based on their commitment to the principles and their endorsement by people I know and trust from common work over a long period, such as Leslie Radford, Sherna Gluck, Bernie Eisenberg, and the candidates with whom I have stronger connections. convinced that the Democratic Party forces that had control at that time, via a self-perpetuating board of Pacifica financing itself and national operations out of revenues from commercialization of the stations' "sideband" frequencies, would have bankrupted the foundation and stations through endless lawsuits -- except for the fact that Bush stole the 2000 election. At that point, needing to keep Pacifica alive for their own purposes, they backed down, settled the lawsuit, created a joint interim Board that adopted restrictively-'democratic' bylaws, and grudgingly agreed to allow a certain number of grassroots community voices of people of color back on the air. Now, with the Democratic Party enjoying control of the White House, the Congress and Senate, these same forces are prepared to break the social contract and coalition that has sustained KPFK and Pacifica as free-speech community oriented media outlets. They want to rule or ruin, with all power and access in their own hands. They plan to seek foundation funding and underwriters, big ticket donors and thereby free themselves from concern about or accountability to the listeners. They are following the same strategy of purging programmers and staffers of color who do not toe their line, such as Bernard White in NY and Jerry Quickley in L.A. If you want the station and the network to survive in any meaningful form, let alone to thrive as a breath of fresh air politically, culturally and artistically, you must vote for the list of candidates I have named. Otherwise, KPFK will be doomed to increasing irrelevance, its audience shrinking and aging, its airwaves alienating rather than inviting the new generation of young people in struggle for a better, freer future, for liberation and decolonization.